Selected and red for their special physical characteristics, such as size, body shape or feathering - frilled or unfrilled feathering, with crests (coronas) or without crests (consorts or plainheads). Selectively bred cross between Red-Factor and Gloster Canaries. Can be either crested or non-crested. Plumages occur in red or rose ground colors. Oldest known variety. Produced for the scale-like spangled plumage effect produced by the overlapping of the feathers and the different type of edging on the feathers. This effect is a result of a gene that restricts the tendency of melanin in the feathers. This scale-like effect diminishes over time, and is most intense in its first year. Origin: Developed from a canary mutation that occurred in France during the early 1700s. Ideal length is 5.5 inches or 14 cm. Small and compact, with a round body and glossy plumage. 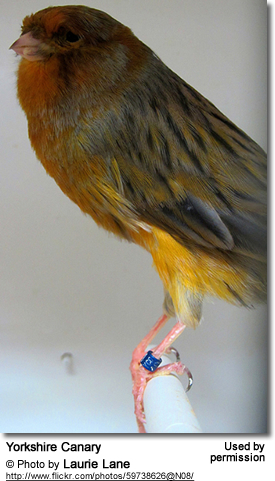 Selectively bred English/Scottish Canary that stands at a 60 degree angle. Plumage smooth and glossy. 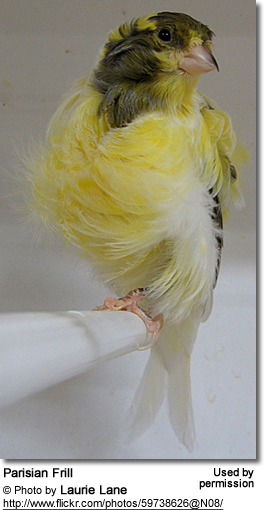 Plumage is often yellow, but a variety of other colors have also occurred, including white, buff, green, cinnamon - possibly variegated or ticked. Lively cage bird with a variety of pleasing songs. Can easily be confused with the Gloster Canary but can be identified by its more intense "chopper" type song. Maximum body length of 4.5 inches or 11.5 cm. Narrow and slim chest and back. Small, peanut-sized head. 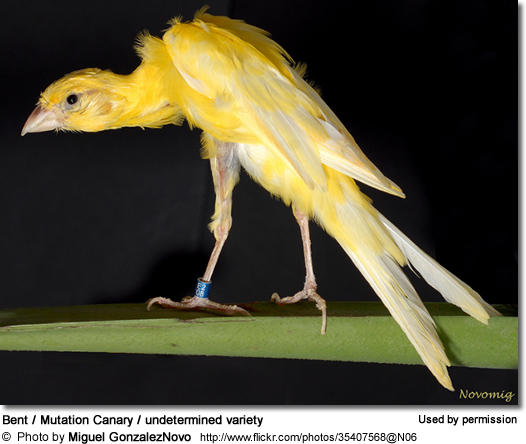 Even though this canary is bred for its song, it is not recognized as a "song canary." 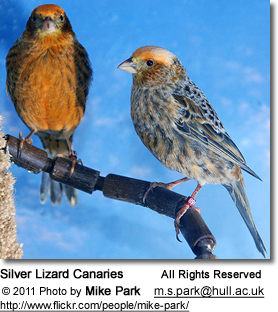 Selectively bred miniature Border Canaries which measure no more than 4.5 inches or 11.4 cm in length. Selectively bred for large, bulky size and puffiness of the feathers. Well rounded shape with short wings and tail. Sedentary in nature. 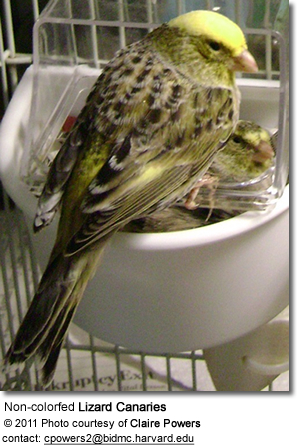 The largest of all English breeds of canary ideally measuring 8" or 20cm in length. Both crested (coronas) and plain-headed / uncrested birds exist (plainheads). Plumage should be yellow except for the occasional grey or grizzled crest. . Selectively bred combination of the Lancashire Plainhead to obtain length, the Belgium Fancy for the shoulders, legs and stance and the old style Norwich for color and feather quality. Body shape similar to that of a bullfinch with a length of about 6.7 inches or 17 cm. Erect position; maximum height is 6 inches or 16 cm. Short and broad head, flat on top with protruding forehead. Moderately long neck. Long and narrow tail that is in line with the back. Erect position, standing at an angle of 60º . Stands up to 6.7 inches or 17 cm tall. Elongated, slender body with a slightly cylindrical form. Very long, narrow tail with fork-shaped tip. Scots Fancy Canary aka Scotch Fancy Canary, aka Scottish Canary, Glasgow Don or The Bird o' Circle'. Origin: Developed in Glasgow in Scotland from imported Belgian canary stock during the early 1800s. Long, thin bird with a neck that extends forward, shoulders are raised in a hump posture - birds adopt the shape of the figure "7" or the form of an inverted half moon. These birds tend to be shy, high strung and more difficult to breed. Poor parenting skills. Recommended for advanced breeders only. Head, neck and body form a slightly curved line. Small head. Long, narrow neck. Long, narrow neck. Narrow and rounded chest. Narrow shoulders. Long wings that are carried close to the body. Back and body rounded to form an arch (half moon). Erect position with slightly rounded back; head crest that is shaped like a horse-shoe and extends forward from above the eyes. The feathers curl in distinctive pattern. Feathers range from dense plumages to sparse and crisps feathering. Stance and position also vary between the breeds. Ideal size is 6.7 - 7.1 inches or 17 - 18 cm. The feathers on the side (flanks) are long and symmetrical, and rise well up round the wings. Feathers on the mantle (upper back) are symmetrical and falling evenly over the shoulders with a central parting and covering two thirds of the back. The feathers on the crop (chest) form the shape of a heart. Ideal size: 7.1 - 7.5 inches or 18 - 19 cm. Erect position (65º). Plumage is silky and abundant. Crested birds have well-shaped, symmetrical head crests with a small central point. Uncrested canaries (Plainheads) have round and broad heads with heavy eyebrows. Short frills around the neck area in the shape of a short collar. Voluminous and symmetrical frills on the mantle (covering about two thirds of the back) with frills that fall evenly over the shoulders with a central parting. Symmetrical frills that rise well round the wings. Up to 5 inches or 7 cm in length. Erect position. Crested and uncrested version. Crested form with full round crest. Plainheads should have round heads with pronounced eyebrows. Silky plumage with voluminous frills on the mantle and the sides. About 5 inches or 13 cm long. Frills on both sides of the chest that curl towards the center touching each other. Abdomen is also frilled. Frills on the head, around the neck (collar) and on the cheeks (whiskers-effect). Minimum length 8 inches or 21 cm. Erect position. Tail is in line with the body or slightly drooped. Conical beak with wide base. Round neck with neck feathers that project upwards to form the "raised collar". Fine, silky feathers rise and curve from the flanks to come alongside the wings. Long and broad feathers part from a point on the center of the back and extend symmetrically towards the head and over the sides, forming a "rose-shaped" mantle. Silky and fine feathers fall from the rump and over both sides in in the form of a bouquet. Feathers on the crop t converge upwards from both sides forming a "fan" that extends to the edge of the head collar. Feathers project forward and upwards from the abdomen to join up with the crop feathers. At least 7 inches or 18 cm tall, with a position that is erect in the shape of a figure "1". Short frills on the throat that part symmetrically from both sides of the chest towards the center. Frills part from the sides of the body forming two large fins, directed away from the wings. Frills on the upper / central back (mantle) that fall to both sides from a central back parting. Ideal length of 6.7 - 7.1 inches (17 - 18 cm). Body shape of a half moon. Long, narrow tail that continues the shape of the body. Small, oval head and long, slim neck without frills. Feathers on the mantle are long and straight, extending over two thirds of the back. Feathers on the crop area are in the shape of a basket - well separated from the flanks (side of the body). Medium sized variety - slightly smaller than the well-known Border Canary. Resembles the Parisian Frilled breed, except has less dense and smaller curls in the form of a band around the middle of the bird, rather than all over. About 17 inches or 6.7 long with a body shaped like a figure "7" as the head and neck are held straight out, parallel to the ground. Neck bent resulting in the bird looking hunch-backed. Long and straight legs with well feathered thighs. Silky, smooth plumage. Frills in the shape of a basket on the upper chest. Long frills on the sides that rise around the wings. Bare / unfeathered head, neck, abdomen and thighs. Length: 5.5 - 5.9 inches (14 - 15 cm). Head, neck and body shape the form of a number "7." Small, slender head. Long neck that is smooth-feathered, projecting forward horizontally in a slight curve. Two small areas with frills in the shape of comas on the upper chest. Frills curve inwards to the center of the chest without meeting. Frills on the side are short and symmetrical, curving outwards to the wings. Length: 6.7 inches or 17 cm. Position shape of a figure "1". Snake-like head and long, slender neck with smooth feathers that project downwards. Frills on the upper chest that curl inwards from both sides towards the center. Frilled feathers on the high shoulders that fall to both sides from a central back parting to form a mantle. Narrow tail curves slightly inwards to just touch the perch.